Wolves, Rivers, Hindsight, and the "Butterfly Effect"
There is a video that is currently being shared on social media by a number of people I know. It is about the reintroduction of wolves into Yellowstone and the wide-ranging effects this “keystone species” had on the environment. A keystone species is a top-of-food-chain creature whose presence or absence has wide-ranging impacts. In the case of wolves, which had been hunted and eradicated, their reintroduction managed to stabilize elk population and a number of other species as well. Even more, vegetation was affected through secondary means. Indeed, the narration in the video says even “the river adapted” to the reintroduction (fewer grazing animals => less deforestation near rivers => strengthened river banks). All this is terrific news. But there is a way that this gets reported that gives me pause. The description of the causal loops are presented as if all this was preordained. As if it was obvious that the rivers would strengthen their banks if only there were wolves. I wonder if the planners really knew that would happen, or whether it is an after-the-fact understanding. Large system responses can be like that: in hindsight it seems obvious. But that is can give the dangerous illusion that we can predict the future if only we are smart enough. The point about some of these large-system effects (eg, the “butterfly effect,” an idea popularized by Edward Lorenz, where the beatings of some butterfly’s wings in one place causes a windstorm elsewhere) is that they are unpredictable ahead of time. We know there are likely to be effects, but cannot say for certain what they will be. It is tempting for hindsight to make us feel smug when looking at our forebears. They should have known, it is easy to think to ourselves. But the nature of such large, open systems as that this is not always the case. It is impossible to know and account for all initial conditions. Posted on August 25, 2016 August 11, 2018 Categories TechTags PUAD6111 Comment on Wolves, Rivers, Hindsight, and the "Butterfly Effect"
In a class, we have been talking a little bit about “co-production” from the standpoint of federal government organizations. Co-production is the idea that institutions and citizens (or other entities) can and should work in complementary ways. As an example, the “see something, say something” campaign is such an effort. There are a couple of ways of looking at this idea. One is from an institutional standpoint: How can we get citizens to “do their part?” This is illustrated in a video based on work by Edgar Cahn, called the Parable of the Blobs and Squares. The video describes a vexing problem when it comes to co-production. Institutions (squares) tend to force citizens (blobs) to function like squares when they try to work together. This ingenious video uses cartoon-like blobs and squares to illustrate the different contributions that institutions and people can make in solving problems, and . . . paints a good picture of the relationship that I see most frequently when institutions try to solve problems through the most typical paths of community engagement. In my experience, community engagement for most institutions (governments, foundations, established non-profits) involves people in institutions (squares) talking to people (blobs) to understand a problem and get their advice on how they should solve the problem. Institutions talk to people individually (surveys) or collectively (focus groups or forums or via other community engagement processes). . . . Too often, when they give grants to community groups, they do that without understanding what they are doing to them by forcing them into a non-profit organization mold by their requirements or expectations. It also shows what happens to the grassroots groups that people in a community form for mutual aid and collective action become more like squares than blobs – most often, when they are trying to gain legitimacy or find resources in their quest to get something done about a big problem in their community. They gain something (capacity to do things that squares are good at doing) but they lose something (capacity to do what blobs are good at doing). This video . . . calls for co-production – a way of working together that allows squares to do what they do well and blobs to bring their unique gifts, perspectives and talents to the table. [O]ne of the things that makes it hard is that we – all of us – have a love-affair with squares and a dismissive attitude about blobs. Our love affair with squares has made us forget that we all are also blobs in some hours of our day or that the world of blobs even exists. But it does not have to be this way. We can, instead, see that there are shared concerns that both institutions and citizens have — and that both “squares” and “blobs” have an interest and things to contribute. So instead of seeing Neighborhood Watch programs as “citizens helping the police,” we might instead be able to see a way to define public safety as a shared endeavor in the community. In this instance, then, the police would in fact be “helping the community” rather than vice versa. This is not pie-in-the-sky, though it is an alternative way of seeing things. Indeed, Nobel Prize winner in economics Elinor Ostrom won her shared award for showing that resources in the commons could be effectively managed through co-production of citizens. What examples have you seen, if any, of this kind of co-production? My guess is this happens on a smaller scale more frequently than on larger scales. A Fourth Systems Thinking Building Block? Some of my friends and readers know I am nearly finished pursuing a master’s degree in public administration at American University. (No, I am not intending to pursue a career in the federal government; the MPA is like the MBA of the social sector and I thought it a useful higher degree to have.) In my current course, which focuses on systems-level technology and change management, I have had the pleasure of re-reading Peter Senge’s seminal The Fifth Discipline, which I read decades ago when it first came out. When I first read it, I really didn’t know anything about anything and had certainly not worked long enough in any organization to grasp what Senge was saying. So reading this work now has been a highlight of my program. One of Senge’s core points is that by looking at system archetypes, it is possible to determine ways to address problems that otherwise would be vexing and intractable. That is, by seeing systems we are able to see relationships and leverage points that are otherwise invisible. An example is the “tragedy of the commons” archetype as it relates to, say, traffic. Traffic jams are often the result of a systemic tragedy of the commons, where individual self-interested (and reasonable) behavior results in cars vying for the same small piece of real estate. The knee-jerk reaction to a persistent traffic jam at a certain freeway entrance might be top widen it, the logic being that it must be a bottleneck. But by taking a systems view, another answer might present itself: throttle down the traffic entering the onramp by using, say, an alternate-lane traffic signal. Senge presents a number of systemic archetypes. But what interests me is that the fundamental building blocks for all of these archetypes are just three processes. Systems are built out of combinations of amplifying processes (which can either go upwards or downwards), balancing processes (where change is resisted by the system), or feedback delays (where there is a lag between cause and effect). When I read this as a young person, I did not see how sweeping this claim is. Three processes describe all systems. It’s as crazy as saying just four amino acids can be combined to create the blueprint for all of the varied life on Earth! Ludwig Boltzman’s grave. Boltzman first theorized about entropy. This is important to me, as I study political ecosystems in community. Is it possible to describe all such systems using just three building blocks? I am resistant to the idea. Political systems are comprised of individuals, all acting on their own and operating within multilayered and interlocking networks of association. It seems too mechanistic to think that three Newtonian laws would account for all the activity I see. I have thought of a fourth potential “fundamental process,” especially as it relates to human behavior, but I am not sure it counts in this way of thinking. The process is entropy: the tendency for any system to move towards randomness unless energy is added into it. This seems like it might be a confounding factor in any of the feedback processes described above. Posted on July 22, 2016 August 11, 2018 Categories business, education, TechTags PUAD6112 Comments on A Fourth Systems Thinking Building Block? Friends and colleagues know that I am very, very heavily into new technology — and I typically put it through its paces. I want everything just to work. I am also seemingly on a constant search to find just the right tool for the right job. When it comes to matching computing activity with equipment, we have more and more choices today than we ever had. That is especially true when it comes to mobile computing tasks. Laptops come in all manner of horsepower and form factor, and we use them all heavily in my home, from my son’s large media-based HP (and my MacBook Pro) to my daughter’s use-in-the-bedroom MacBook, my workhorse-professional Sony Vaio running Win7 Ultimate, to our two iPads for around-the-house quick tasks and lightweight business travel, and assorted smartphones including a Droid, Blackberry, and Verizon iPhone. I want to focus on a new tool in the around-the-house-casual-computing space that I have come to use. This space had previously been dominated, in my own life, by my iPad. But, some time ago I was admitted into Google’s Chrome OS Notebook Pilot program. As a part of that program, Google sent me a prototype laptop (there is no branding on it whatsoever) loaded with Google’s new Chrome operating system. They call the computer the CR-48. The Chrome OS is a new operating system designed to live in the mobile / netbook space. It is lightweight and meant for many, but not all, computing tasks. It is somewhat revolutionary in that the whole operating system is essentially a Chrome browser. There are no applications on the machine, no files and folders to move around or keep track of. It is designed entirely to live connected to the Internet. The way it works, you turn the machine on and it is ready to go in about 20 seconds or less. You sign in with your Google credentials, and the machine is completely configured for you. Your bookmarks, your email, your Docs, your everything. Nothing lives on the machine, so you can let your son use it and he can sign in with his own Google credentials — when he does, it is ready to rock for him, with his bookmarks and everything. Using it for a few weeks now, I have found myself gravitating to it more and more around the house, because it is so easy to use. The iPad is awesome and you can only have it after you pry it from my cold, dead hands. However, it always feels limited when I get on the Web. It almost can do everything, but not quite. No Flash videos, of course, but even more important for me is I can’t write a Facebook Note because the way the editor renders, the input box can’t be used. Google Docs are hard to edit too. Just little things like that. On the other hand, using the CR-48, I am just using a regular browser so it all works perfectly. At the other end of the scale, I am also finding that the CR-48 is replacing my professional laptop (on my office desk) for many tasks too. The CR-48 has a solid state disk drive (no moving parts) so it feels very sturdy, and it is ready to go on a moment’s notice. I find it easier to pick it up and dispatch a work task. In fact, I will often have my work laptop going, doing something I have to use a computer for, and also have the CR-48 open with my mail and other web applications in use. Why Do I Need A Real Computer? So that gets me to: What can’t the CR-48 do? In other words, in what contexts do you need a “real” computer? 1) Financial management programs. Like a lot of people, my financial life is lived on Quicken (and on the business side it is lived on Quickbooks). I have so much time, history, and energy invested in those applications that I need to have access to them. There are no suitable web-based versions — yet. Intuit bought Mint.com, and they are working at integrating Quicken and Mint, but for now they are standing apart. And, while there is a Quickbooks Online, I have found it a little limited and for some tasks it seems to require Internet Explorer (the CR-48 is, by definition, a Chrome browser). 2) Sharing Microsoft Word docs and reviewing them using Track Changes. For almost all document purposes, Google Docs works well and you can throw almost anything at it and it will translate it into a usable web-based document. However, for many professional situations, people prefer to edit documents using Word’s Track Changes feature. You can’t go seamlessly from Word to Docs and back and retain the Track Changes information, so when I am collaborating on documents I sometimes need Word. I have experimented with creating documents that I know will be collaborative in Google Docs from the get-go, but only a handful of colleagues have proven amenable to working in that space. I believe over time this will change, but for now I sometimes just have to bust out Word. 3) Photo management using Picasa. I have a large library of photos and use it frequently for blog posts and other purposes. While there are great online photo management services (Flickr, Picasa) and even great online photo editing services (e.g. Picnik) none of them hold a candle to the ease and speed with which you can work on a desktop. 4) Video production. There are sort of, kind of online video production suites but they work only so-so with Chrome. The bandwidth and processing issues are almost, but not quite, surmounted for this. So, if I want to edit a video, I need to do it on my desktop. (Although, I edit video less and less and my iPhone has an iMovie app I have not yet put through its paces). My friends know that I’ve been waiting with bated breath for the iPhone to finally come to Verizon. I refuse to put up with AT&T’s network problems. Up to now, I have been happy with my Motorola Droid (I am a big-time Google guy) but in hindsight I have to admit it was always a stopgap while I waited for the iPhone. Google Voice is often referred to as the “one number to rule them all” service. That does not really describe what the service does — or can do. I have been a user of the service since it began (and used its predecessor, Grand Central, before that). Some of my friends have asked me about the ins and outs, so I thought I would gather my thoughts here. Google Voice is especially useful to solopreneurs, or anyone with a highly mobile lifestyle. And, while there are a number of creative things you can do with Google Voice, I am going to focus here on the two main ways to use it in that context: as a front-end, and as a back-end. Google Voice is not a telephone service per se. It’s a telephone number, along with routing capabilities. What does that mean? It means that once you have signed up, you are given a telephone number. You can then sign in, and add your existing numbers (cell phones, home, office, others) to your account. Then, you can tell Google Voice to ring certain of your real phones when people call your Voice number. Google Voice also comes with voicemail, and it transcribes your messages for you. You can also send SMS messages (texts) through it. To make a call, you use the Web interface to tell Vice what number you would like to call, and from what phone you would like to make the call. Google Voice then calls your phone and the recipient phone. You can also do this just through the phone, by calling your Voice number and pressing 2. There is an Android app for Voice, and it integrates very will with your Google contacts list. There’s a great bumch of videos at the Google Voice YouTube channel here. Google Voice is a free service, though it is “closed beta,” which means you need someone who is a current user to invite you. Then, behind the scenes, you can tell Google Voice how you want to handle things. You can tell it to automatically ring your office phone during certain hours, and your home phone other times. You can set it to go straight voicemail at night. Or, you can ring your cell phone and office phones simultaneously (so people don’t have to dial multiple phones to get you). You can also set it so that certain callers go to your home number, and others to your work number. The benefits of this are that you never have to change your number again, whether you move, get a new cell phone or whatever. You also have a great deal of control about whom you talk to — if there are certain callers you’d rather not ever deal with, they can go straight to voicemail. 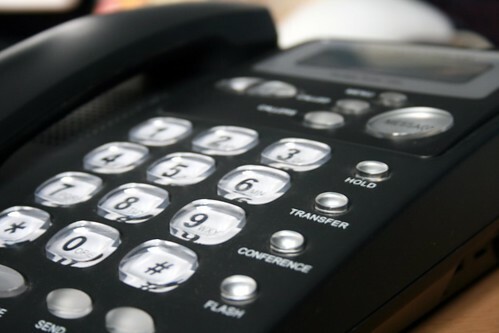 The downside is that it can take some discipline in the transition: it’s tempting to call someone back on your cell phone, but then they will have your cell number and will want to use that. So you should use the Voice system instead, which is an extra step. The other way to use Google Voice is to take advantage of the sophisticated voicemail functions and use it as a universal Inbox for all voice messages. To do this, you set Google Voice on “Do Not Disturb.” Now, any call coming into Google Voice will go right to voicemail, and you will then get a transcribed email with attached audio file. Then, you set your various regular phone numbers to autoforward to Google Voice after a certain number of rings. In other words, you turn off all your other voicemail systems. So what’s happening is that if I don’t answer a phone, it automoatically kicks over to Google Voice voicemail and I get that message emailed to me. The benefit of this approach is that you basically never have to check voicemail, and every voicemail ends up in the Inbox you use every day. And, you don’t have to tell people to call a new number. Finally, you can use your Google Voice number as throwaway number for telemarketers, etc., because you will never answer it. A downside for many people is that it takes some set up, in a number of different phone systems, to get this all working smoothly. Also, many people are aware that Google Voice’s transcription capabilities can sometimes be lacking (or maybe it’s people’s ability to enunciate). You can get some pretty funny transcriptions. However, it’s almost always correct when it comes to transcribing numbers, and at a minimum you can get the gist of someone’s message, and determine if you really need to listen to it or not. Because so many people have various numbers, I have opted to use Google Voice as a back-end to my phone system, and it has been working well for me. I’ve been thinking of switching to the front-end approach, because I think it’s more powerful if I can discipline myself to use it properly. How about you? Do you use Google Voice? How? How does it work for you? There are more advanced things you can do with this service, too — do you take advantage of any unusual tricks? Let me know in the comments! For Christmas this year, some family members fulfilled a long-standing desire I’d had and got me a Livescribe Smart Pen. I’ve been using it for a couple of weeks now, and I think this product is a potential game-changer. As a tool for capturing, manipulating, and sharing notes on the go, it just can’t be beat. The Livescribe is basically a special pen that works on special paper. The paper has a pattern printed on the background, which to the naked eye looks like a slight shading. The pen has a sensor that uses the pattern to determine where you are writing. The pen records your pen strokes and can also record audio, connecting what it hears with what you are writing. This then syncs to desktop software. You can export the resulting pages into PDF and other formats, and share them in other ways. I think this can be of great use to folks who are public leaders or are in the public eye. Such leaders need to always be recording, documenting, and sharing what they do but do not have the luxury of hanging around the office in front of the computer all the time. This can make all that much, much more seamless and simple. You can see more about the Livescribe here and learn more about the company here.